Source: CICH graphic created using data adapted from Macdonald D and Friendly M. A Growing Concern. 2016 Child Care Fees in Canada’s Big Cities. Canadian Centre for Policy Alternatives. 2016. https://www.policyalternatives.ca/sites/default/files/uploads/publications/National%20Office/2016/12/A_Growing_Concern.pdf -accessed July 25, 2017. 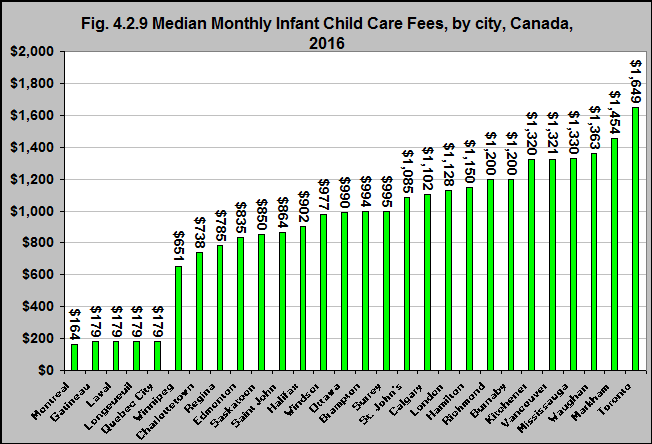 The median monthly child care fees for infants* varied widely across cities in Canada in 2016. The lowest fees were in Québec – Montréal being $164 per month and Québec City, Longeueuil, Laval & Gatineau being $179. The highest fees were in Ontario – with Toronto at $1,649; Markham at $1,454; and Vaughan and Mississauga not far behind. This was followed by British Columbia – Vancouver at $1,321. *Infants- although the exact age range differs by province/territory, it is roughly children 1.5 years old and younger. **Toddlers- although the age range differs by province/territory, toddlers are generally aged 1.5 to three years old. ***Preschool- although the age range differs by province/territory, preschoolers are generally from three years old to kindergarten-age or school-age (between four and six years). 1Macdonald D. and Friendly M. A Growing Concern. 2016 Child Care Fees in Canada’s Big Cities. Canadian Centre for Policy Alternatives. 2016. https://www.policyalternatives.ca/sites/default/files/uploads/publications/National%20Office/2016/12/A_Growing_Concern.pdf-accessed July 25, 2017.